Save the dates October 10-12. The Chicago French Market embraces the cooler weather, fall leaves and harvest ingredients with its Market Festival, October 10-12. Come embrace the season by tasting the best harvest offerings such as Pumpkin Spice Soup and Thanksgiving Grilled Cheese Sandwich from Spicy Monkey; Candy Apples from Superior Nut and Candy; Red Apple and Cranberry Pear Balsamic, Autumn Harvest and Pumpkin Patch Teas, or Butternut Squash Sauce from Oh Olive! ; Harvest Kale Soup from Fumare Meats and Deli; American Craft and German Oktoberfest beers from Frietkoten, and Pumpkin Pie Soap from Abbey Brown Artisan Soap, just to name a few. The festival culminates with a full day of entertainment and special tastings Saturday, October 12. Prairie Grass Cafe, located at 601 Skokie Boulevard in Northbrook, Ill. (telephone 847-205-4433), has planned a special celebration for beer lovers throughout the month of October with Craft Beer Tuesdays. Each Tuesday during October, beginning at 5 p.m., guests aged 21 and over will be offered complimentary 2-oz. tastings of three featured craft beers ($10 minimum food order is required). The three beers will change every Tuesday, giving guests the opportunity to enjoy tasting fifteen different artisan beers throughout the month, which has five Tuesdays in 2013. Prairie Grass Café will add a tasty element to Craft Beer Tuesdays with some special appetizers, especially chosen to accompany the craft beers. 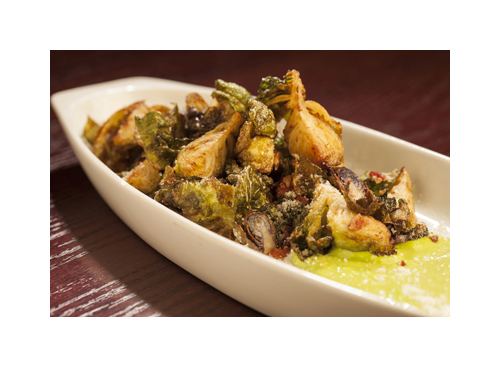 Enjoy the Local Heirloom Luxury Pie Pumpkin Fritters with cinnamon pumpkin butter ($7.50) or the Crispy Brussels Sprouts with basil remoulade, parmesan and local bacon ($8.50; photo,right). Both appetizers are perfect for sharing. To kick off “Craft Beer Tuesdays,” on October 1, Prairie Grass Cafe will feature beers from Revolution Brewing in Chicago: Oktoberfest (logo, left), Eugene Porter, and Anti-Hero IPA. Revolution Brewing, one of the new Chicago breweries, was founded in 2010. Its managing partner, Josh Deth, started his beer career as a home brewer and cleaned the kegs at the now defunct Golden Prairie Brewery. On October 8, the beers of Bell’s Brewery from Comstock, Michigan will be showcased: Oberon, Two Hearted Ale and Best Brown Ale. Bell’s was founded by Larry Bell in 1985, one of the first Midwest micro breweries. Larry’s newest venture is going to be in the Upper Peninsula of Michigan in Escanaba – a completely new brewery named Upper Hand. Three beers also will be featured on October 15, 22, and 29. To obtain more information about Prairie Grass Cafe’s “Craft Beer Tuesdays,” or to make lunch or dinner reservations, please call the restaurant at (847) 205-4433 or visit their website at www.prairiegrasscafe.com. With the change in the season, Wisma has introduced several new seasonal menu items: an Indian Style Curry ($10) with jasmine rice, coconut, tomato, radish, green pepper, broccoli, scallion, onion and herbs and spices, and a new Linguini with Gulf Shrimp dish ($9) with linguini noodles, white shrimp cauliflower, zucchini, parmesan cheese, onion, garlic, herbs and spices. Chef John Des Rosier and his team will be creating a special weekly soup. This soup will be surprise, made from whatever are the freshest, savory ingredients, and will never be repeated. 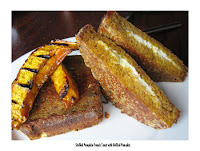 Prairie Grass Cafe uses two pumpkin varieties. The first, the Heirloom Luxury Pie Pumpkin, is a beautiful pumpkin that was introduced in 1893 by Johnson & Stokes. The Heirloom Luxury Pie Pumpkin is a lovely golden fruit with white netting, typically in the 6lb range and perfect for pie making. 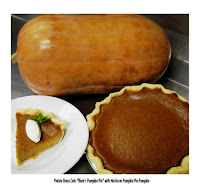 In fact, this is one of the best tasting pie pumpkins you can use; with very sweet and smooth flesh, it's a favorite of all who use it," according to SeedSavers.org. Sarah says it's petite and has a smooth silky texture and intense pumpkin flavor. "It's also perfect for our grilled pumpkin." Tracey Vowell and Kathe Roybal worked in the restaurant industry until they grew tired of the hard work and decided on a career change. They bought their nine-acre farm in 2000, and named it after the Native American practice of growing corn, beans, and squash in the same mounds - a sophisticated, sustainable system that provided long-term soil fertility and a healthy diet then, and still does. The partners (that's Tracey on left, Kathe at right) focus on specialty vegetables like microgreens (which they grow year-round), pea shoots, heirloom tomatoes, summer and winter squashes, herbs, fresh beans (shelled at the Market) and huitlacoche, a mushroom particularly prized in Mexican cuisine. 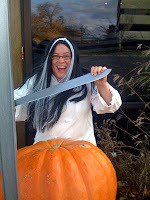 "Tracey from Three Sisters Garden agreed to grow Heirloom Luxury Pie Pumpkins for me. 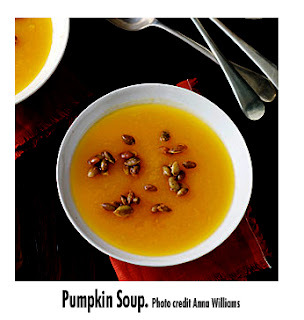 They are less stringy and less watery then a regular pumpkin. They have intense pumpkin flavor. Each year we have sold out on all her pumpkins. This year she grew 1500 lbs for us! They are really delicious!" 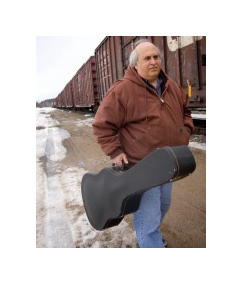 Folk musician Steve Justman joins the lunchtime crowds from 11-2 p.m., March 21. Justman is a Chicago area musician who specializes in performing Americana music. He has performed in many venues in the Chicago area and is excited to return to The Chicago French Market. Oceanique Restaurant, 505 Main Street, Evanston, Illinois (847-864-3435), will host a special wine dinner at 7:30 p.m., Monday, September 30, 2013, featuring the wines of the highly acclaimed Vins & Vignobles Dourthe from Bordeaux, France. Patrick Jestin, President of Dourth, will be the special host, discussing the history of the winery and the uniqueness and quality of the wines. 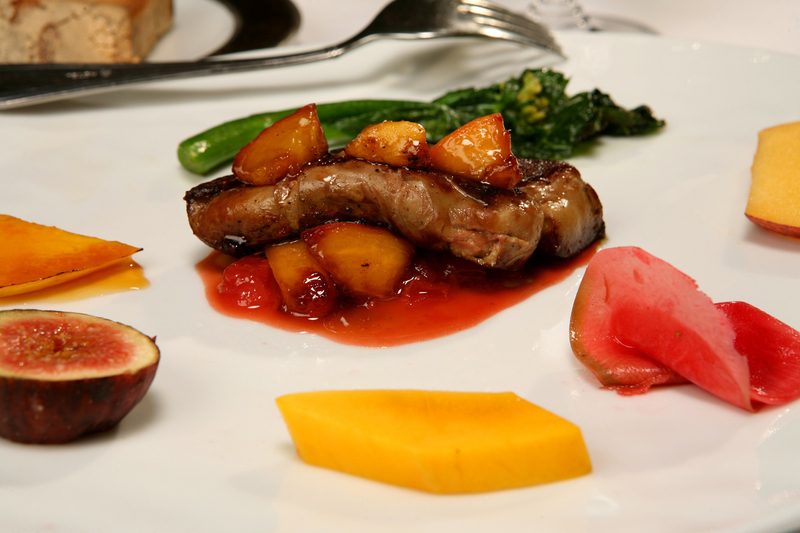 The dinner will feature a 6-course menu prepared by chef/owner Mark Grosz. The price is $195 per person, excluding tax and gratuity. 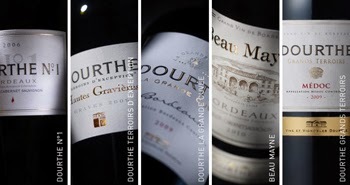 Dourthe was founded in 1840 and is considered by many to be one of the finest in the Bordeaux region of France. The winery was honored in 2007 as Best Producer of French wine by the international competition of Wine & Spirits. With vineyards in the Médoc, Saint-Estèphe, Pessac-Léognan and Saint-Emilion areas of Bordeaux, Dourthe produces distinctive wines using sustainable methods, with the goal of being standard bearers of the appellation. "This is going to be an exciting and unique experience," said Oceanique’s wine director, Philippe André. "Dourthe is a very special Bordeaux winemaker in that they own vineyards in several areas of Bordeaux, unlike most Bordeaux vintners who have only one vineyard. Because the Dourthe team is so familiar with the variances in soil and climate of the entire Bordeaux region, they are able to bring subtle knowledge to the process of blending. The result is a collection of wines that are the ultimate expression of Bordeaux." Oceanique, celebrating its 25th anniversary in 2014 (February 5, 2014), is one of the Chicago area’s finest and most acclaimed restaurants, serving contemporary French-American cuisine in a beautiful, new dining room. The restaurant is owned by Chef Mark Grosz and his wife, Renée André. The Pastry Chef is Abel Garcia and the Wine Director is Philippe André. The bar area has been expanded and features a new small plates menu to accompany the fine selection of wines, craft beers and artisan cocktails. Guests are encouraged to enjoy a casual meal in the bar area or enjoy the full à la carte and dégustation menus in the dining room. The bar even includes a communal table to encourage single dining or groups. Oceanique serves dinner from 5:30 p.m. to 9:30 p.m., Monday-Thursday and from 5:30 p.m. to 10 p.m. on Friday and Saturday. The restaurant is closed on Sundays. Valet parking is available and all major cards are accepted. A private room is available for group events. For more information or to make reservations, please contact Oceanique at 847-864-3435 or visit the website at www.oceanique.com. The newly expanded selection includes classic expressions of the world's major wine regions and intriguing bottles from exotic locales, both popular varietals and exciting blends. From Bordeaux to Mendoza, and Merlot to Bonarda, Pastoral believes that exploring wine should be as fun, delicious and enlightening as choosing cheese. 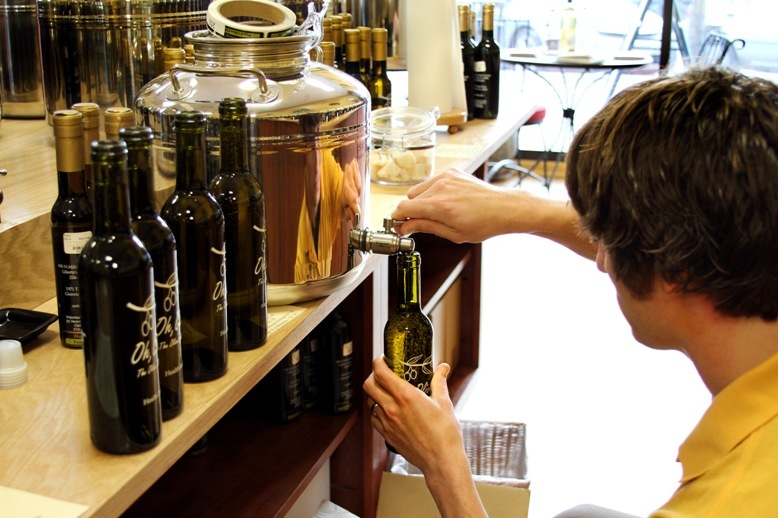 Shoppers are invited to stop by to check out the wine wall; the wines are arranged by body, from lightest to fullest, to mirror the cheeses in the display case, from the freshest to the most aged, with which they will pair well. Their knowledgeable staff is always eager to help. Throughout its 25-year history, Oceanique has built such a great wine program that the restaurant has become a magnet for people who are knowledgeable about wine and want to try some of the best in the world. "Our wine cellar is so extensive that we have a wine for anyone, no matter what dishes they are enjoying, what style of wine they prefer, or what their desired price point," says Oceanique's Wine Director, Philippe André. André has been leading the wine program at Oceanique for several years and his passion for wines and his commitment to the wine and spirits enjoyment of his guests, continues to grow. "We have invested heavily in our wine collection so it is a true joy to share our bounty with our guests," he says. "I love educating our guests and helping them to choose the most enjoyable and appropriate wines to suit their food and their mood." Oceanique's collection, which includes more than 700 labels and between 8,000 and 9,000 bottles, has earned national recognition from Wine Spectator, the most prestigious wine publication. As the winner of Wine Spectator's "Best of Award of Excellence" every year since 1994, Oceanique's wine list is considered among the 750 best in the world. 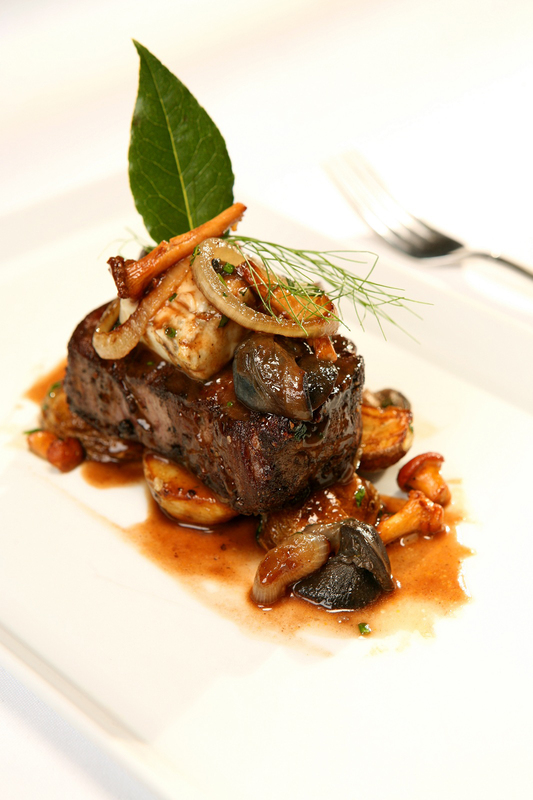 "We believe that great wine and great food together create a perfect marriage, and so we devote as much time and attention to our wine program as we do to our culinary program," says owner and chef Mark Grosz. "Our approach is to offer our guests many options, all of which lead to a memorable wine experience. We have many great wines by the glass and half bottles, several levels of wine pairings and a comprehensive selection of wines by the bottle, all from all around the globe." The success of the wine program can be measured in several ways, but one measuring stick they are particulary proud is the long list of wine aficionados who have been coming to Oceanique for many years. "Our clientele is discerning and knowledgeable about wines," says André. "Our mission is to present them with wines that, in addition to being great at any price point, are a perfect fit for their stylistic preferences and their food. If we accomplish that, we have succeeded. We also enjoy raising the bar even higher by introducing them to lesser known wines that are of surprisingly great quality and are a great value. We are thrilled to share our great finds with our customers." On any given evening, one will find André in the dining room or at the bar area, talking passionately and uncondescendingly to his guests about his suggestions for wine pairings. "I love being a wine educator, talking wine with both experts and novices alike," he explains. "It gives me great satisfaction to see the look of joy on our guests' faces when they sample a new wine that is the perfect match for their meal." The multi-faceted nature of Oceanique's wine program makes it easy for guests to enjoy a personalized wine experience. Oceanique offers three levels of wine pairings (wine flights) which begin with a glass of champagne and then a glass of wine with each course. 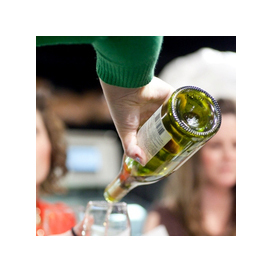 Guests who wish to enjoy more than one wine can order wine by the half glass, full glass or half bottle (375 ml). The list of wines by the bottle is extraordinarily varied and well organized. Wines can be enjoyed for modest prices or, for those who want to splurge, there are numerous great and rare wines that are high-priced but worth every penny. "Our objective is to offer great wines at any price point, and we think we've been very successful in doing this," says André. "Every guest deserves a great wine experience and we won't offer anything less." The breadth and depth of Oceanique's wine list can be daunting to wine lovers who are less knowledgeable. But André is more than pleased to offer guests a very enjoyable wine pairing, with selections chosen to complement each course of the meal. All wines are explained in detail and the presentation is casual and relaxed. There are three levels of wine pairings. The Introductory Wine Pairing ($65) features a glass of Champagne to start, followed by a special wine with each course. The Premier Cru Wine Pairing ($99 per person) is even more precise and elegant, featuring only wines with the Premier Cru designation. For guests who would like a true oenological adventure, André will serve a Grand Cru Wine Pairing ($199 per person) featuring exceptional wines from Oceanique's wine cellar. Topping Oceanique's outstanding wine collection is the Chef's Reserve List, featuring rare, extraordinary wines that are also exceptional values. Bordeaux wines on the Reserve List include a 1990 Chateau Latour ($1,776), a 1990 Chateau Lafite Rothschild ($1,675) and a 1966 Chateau Mouton Rothschild ($900). Other Reserve List selections of note are the 1970 Château Magdelaine Saint Émilion ($450), a 1989 Château Margaux ($595) and several Bordeaux wines from great years, including the 1961 Château Montrose ($950) from the Saint Estéphe region and a 1961 Château Lynch-Bages ($850) from the Pauillac region; the 1982 Chateau Giscours ($385) from Margaux and the 1982 Chateau Poujeaux ($350) from the Moulis-en-Medoc region. Champagnes by the half bottle range from $50 to $75 and include Pierre Peters Brut Blanc de Blancs, Grand Cru; Duval-Leroy Brut Rosé, Vertus; and Chartogne-Taillet Brut "Cuvée Saint-Anne. Champagnes by the bottle are organized into serveral collections, from exclusive rare vintages to Champagnes that are reasonably priced and great values. The "Vintage" Champagne collections by the bottle range in price from $144 for the 2000 Henri Mandois Blanc de Blancs, Premier Cru to $900 for the rare 1982 Dom Pérignon Brut. Other excellent vintage Champagnes by the bottle include the 1999 Dom Perignon Brut ($255), 1996 Henriot "Cuvée des Enchanteleurs" Brut ($320), 1998 Perrier-Jouet Fleur de Champagne "Cuvée Bell Epoque" Brut ($205), 1999 Veuve Clicquot Ponsardin Brut "Gold Label" ($165), Nicolas Feuillatte "Cuvée Spécial Milliésmé" Brut ($175), and 1999 Louis Roederer Brut "Cristal" ($425). Oceanique's Grower Champagne collection features estate grown and bottled selections ranging in price from $115 for the Serveaux et Fils Brut "Carte Noire" to $175 for the Varnier-Fanniere Brut Rose, Grand Cru. Other choices include Franoicse Bedel Brut "Entre Ciel et Terre" (100% Pinot Meunier; $160) and the Jean Milan Brut Blanc de Blancs, Grand Cru ($140). Multi-vintage and non-vintage Champagnes range in price from $88 for the Raymond Henriot Brut to $305 for the Krug "Grande Cuvée" Brut, Multi-Vintage. Other excellent choices include the Henriot "Blanc de Blanc Souverain" Brut ($140), Nicolas Feuillatte Brut "Extrem" ($110), and the Alfred Gratien Brut "Classique" ($104). Vintage Rosé Champagnes on the list are headed by the rare 1997 Laurent-Perrier Brut Rosé "Grand Siecle Alexandra ($495) and the 1985 Veuve Clicquot Ponsardin Brut Rosé Reserve "Rare Vintage" ($215). Multi-vintage and non-vintage Rosé Champagnes include the Krug "Grande Cuvée" Brut Rosé, Multi-Vintage, the Laurent-Perrier Cuvée Rosé ($195) and Billecart-Salmon Brut Rosé ($175). The Sparkling Wine collection includes selections from Germany, Austria, Alsace and California. European sparkling wines include a 2000 Max Richter Riesling Brut "Mulheimer Sonnenlay" ($82) from Germany's Mosel region, Szigeti Welschriesling Sekt Brut "Methode Traditionalle" ($55) from Burgenland, Austria, Pierre Sparr Brut Blanc de Blancs "Marquis de Perlade" ($50) from the Alsace region, and Llopart Cava Rosé Brut Reserve ($66) from Penedes, Spain. Domestic sparkling wines include a 2007 Schramsberg Vineyards Brut "Blanc de Noirs" ($70) from California's North Coast, Domaine Chandon "Étoile" Brut ($80) from Napa/Sonoma, and Roederer Estate Brut Rosé from Anderson Valley, California ($79). Another well represented collection at Oceanique is the White Burgundy/"Old World" Chardonnay collection. Chardonnay and White Burgundy wines by the half bottle range from $35 to $84. Excellent choices include the 2008 Michele & Patrice Rion Nuits-St.-Georges "Les Terres Blance", 2010 Kistler "Vine Hill Vineyard from the Russian River Valley, and 2006 Testarossa "Castello" from California's Central Coast. Topping the list of vintage white burgundy wines is the 1992 Domaine Sauzet Montrachet Grand Cru ($900). One also will find excellent choices in the 2005 Francois Mikulski Meursault "Genevieres" Premier Cru ($175), 2009 Paul Peronot Bienvenue Batard-Montrachet Grand Cru ($365), 2006 Maison Champy Corton-Charlemagne Grand Cru ($195), 2005 Sequinot-Bordet Chablis "Vaudesir" Grand Cru ($175), and the 2006 Michel & Joanna Ecard Savigny-Les Beaune "Lès Goudelettes" ($135). Domestic Chardonnay wines are also plentiful at Oceanique. There are several Williams Selyem wines to choose from, such as the 2010 "Drake Estate Vineyard" from the Russian River Valley in Sonoma ($175), the 2008 Hartford Court "Stone Coate Vineyard from the Sonoma Coast ($140), the 2009 ZD Estate "Reserve" from Napa Valley ($160), and the 2004 Hamacher "Cuvee Forets Diverses" from Williamette Valley ($96). Rhône wine lovers will enjoy the 2009 Tardieu-Laurent Hermitage Viognier ($150) or the 2009 Davis Family Vineyards "Cuvee Luke" from the Sierra Foothills in California ($64), a blend of 48% Roussanne, 35% Marsanne, and 17% Viognier. The Sauvignon Blanc wine collection includes both European and domestic wines. Leading the pack is the 2005 Didier Dagueneau Blanc Fume de Pouilly "Silex" ($290) from the Loire Valley in France. Italy is represented by the 2005 Angelo Gaja "Alteni di Brasica" from Langhe, Italy ($190). Value wines in this group include the 2010 Clos Pegase Estate "Mitsuko's Vineyard" from Napa Valley ($64) and the 2012 Terranoble from Central Valley in Chile ($48). Notable Chenin Blancs include the 2004 Nicolas Joly Savennières "Clos de la Coulée de Serrant" ($195) and the 2008 Domaine des Baumard Savennières "Clos du Papillon" ($115). Another well-represented group at Oceanique is the Riesling wines. French Rieslings include the 1996 Rolly Gassmann "Kapelweg de Rorschwihr" ($160) and the 2000 Domaine Marcel Deiss "Saint-Hippolyte" ($117), both from the Alsace region. German Rieslings include the 1990 Max Ferd. Richter "Veldenzer Elisenberg" from Spätlese-Mosel and the 2001 Markus Molitor "Zeltinger Sonnenuhr" from the Auslese-Mosel. Aficionados of Gewürztraminer wines can select a 2003 Albert Seltz "Zotzenberg" Grand Cru ($128) and the 2003 Rolly Gassmann ($92), both from Alsace. A very nice Grüner Veltliner, the 2007 Prager Smaragd "Zwerithaler" from Wachau, Austria ($96), also makes the list. Oceanique's international white wine collection is rounded off by some excellent Italian wines, such as the 2006 Bibi Graetz "Bugia", from Toscana made from Ansonica grapes ($125) and the 2010 La Bellanotte from Fuiuli Isonzo, Italy ($64), made from Pinot Bianco grapes. Austria is represented by the 2008 Sighard Donabaum "S. Dona Smaragd Auleithen" ($90), the 2010 Raventos I Blanc "Silencis" is from Spain ($64), and the 2007 Royal Tokaji Wine Co. "Dry Furmint" is from Hungary ($60). Over the years, Oceanique has procured a majestic French Red Burgundy collection; the wines are also known as "Old World" Pinot Noirs. Topping the collection is the jaw-dropping 1996 DRC Fomanee-Conti Grand Cru Monopole (priced at $14,000). A bit more modestly priced are the 2002 DRC La Tache Grand Cru Monopole ($2,250), the 2002 DRC Richebourg Grand Cru ($1,800), the 2001 DRC Romanee-Saint-Vivant Grand Cru ($1,425), and the 1999 DRC Grands Échézeaux Grand Cru ($1,250), and the 2002 DRC Vosne Romanée "Cuvee Duvault-Blochet" Premier Cru ($755). Among the value wines in the Red Burgundy collection are the 1984 Leroy Nuits-Saint-Georges "Les Pruliers" Premier Cru ($345), the 2009 Domaine Dujac Vosne-Romanee "Aux Malconsorts" Premier Cru ($395), and the 2005 Robert Chevillion Nuits-Saint-Georges "Les Boursellots" Premier Cru ($220). On the more affordable Red Burgundy side are wines including the 2004 Maison Champy Gevrey-Chambertin "Vielees Vignes" ($99) and the 2005 Domaine Clos Solomon Givry "Clos Solomon" Premier Cru Monopole ($82). Oceanique's red wine collection also features a more than ample selection of domestic Pinot Noirs, many of which are excellent and quite affordable. Notable California wines in this group include the 2005 Williams Selyem "Rochioli Riverblock Vineyard ($225) and the 2004 Adrian Fog "Two Sisters Vineyard" ($245), both from the Russian River Valley. Value-priced wines in this group include the 2006 Pali "Cargasacchi Jalama Vineyard" ($90) from Santa Barbara County, the 2005 Amplos "Ampelos Vineyards" ($105) from Santa Rita Hills and the 2008 Davis Family Vineyards ($80) from the Russian River Valley. Oregon produces some of America's finest Pinot Noirs, and many are represented on the wine list, such as the 2007 Dusky Goose "Rambouillet Vineyard ($245) and the 2006 Bergström "Bergström Vineyard ($205), both from Dundee Hills. Domestic Cabernet Sauvignon wines are also numerous. Top Napa Valley wines include the 1997 Caymus "Sepcial Selection" ($445), the 1990 Dunn Vineyards "Howell Mountain" ($385), and the 1998 Diamond Creek "Red Rock Terrace" ($330). Value priced Cabs from Napa include the 2007 Davis Family Vineyards "10th Anniversary Vintage" ($105) and the 2007 Clos Pegase Estate ($88). Featured Washington State Cabernet Sauvignons include the 2003 Carriage House "DuBrul Vineyard" ($165) from Yakima Valley and the 2004 Andrew Will "Champoux Vineyard" ($147) from Vashon. Oceanique also features some South American Cabernet Sauvignons, such as the 2008 Concha y Toro "Don Melchor" ($127) from Puenta Alto, Chile. French Red Bordeaux wines on the list predominately come from Left Bank regions such as Pauillac, Saint Estephe and Margaux, and Right Bank regions such as Saint Émilion and Pomeral. Top selections include a 1990 Château Latour ($1,776), the 1990 Château Lafite Rothschild ($1,675), a 1966 Château Mouton Rothschild ($900), the 1961 Château Montrose ($950), 1961 Château Cos D'Estournel ($850), 1970 Château Magdelaine ($450) and 1995 Château La Dominque ($350). Domestic Merlot aficionados will enjoy top choices such as the 2004 Vérité "Le Desir" ($245) from Sonoma County, the 2001 Leonetti ($195) from Columbia Valley, Washington, and the 2006 HdV "Belle Cousine" from Carneros ($145). Oceanique's Italian wine collection is not as large, but the selections are exceptional. Top wines in this group are several Angelo Gaja wines from Piemonte: a 1978 Barbaresco ($680), a 1996 "Sori San Lorenzo" ($545) and a 1996 "Costa Russi" ($545). Top Tuscan choices include a 1996 Marchesi Rocchettr Sassicaia ($320) and a 2006 Bibi Graetz "Testmatta" ($275). The Rhône wine collection includes some excellent choices from the North such as the 1999 Domaine Jean-Louis Chave ($505) and the 2000 Pierre Gaillard Cote-Rotie ($225). Southern Rhône standouts include the 2003 Château La Nerthe "Cuvee des Cadettes" ($197) and the 2003 Domaine Berthet-Rayne ($164), both from the Châteauneuf-du-Pape region. Lovers of Shiraz, Syrah and Zinfandel wines will not be disappointed at Oceanique. Heading the list of Australian Shiraz wines is the 2001 Penfolds Grange ($595) and the 2004 S.C. Pannell ($156), a blend made from 20% Grenache grapes. Other "New World" wines in this group include a 2004 Piedrasassi ($168) from California and a 2001 Schubert ($145) from New Zealand. Other excellent choices are the 2001 La Jota Vineyard Co. Estate "Howell Mountain" Petite Syrah ($160) from Napa Valley, and the 2002 Renard "Unit Vineyards" Grenache ($125) from Dry Creek, California. Excellent California Zinfandels also are well represented. Among them are the 2005 Turley "Dogtown Vineyard" ($195) from Lodi, the 2000 Chase "Hayne Vineyard"($170) from Napa Valley, and the 2006 Williams Selyem "Forchini Vineyard" ($148) from the Russian River Valley. Spanish reds on the list include the very special 1998 Vega Sicilia "Unico" ($800) from the Ribera del Duero region, the 2002 Remirez de Ganuza ($235) and the 1996 Contino Gran Reserva ($175), both from Rioja. Dessert Wines Oceanique also has procured a generous selection of dessert wines from Europe and the United States. French Champagnes that excel as accompaniments to dessert include Moet & Chandon Rose "Nectar Imperial" ($110) and the Mumm "Joyesse" Demi-Sec ($99), both are non-vintage. The French Dordogne wine group is headed by a 1982 Cos Fontindoule-Monbazillac ($165) and a 1990 Domaine de L'Ancienne Cure-Monbazillac "Cuvée Abbaye" ($145). Several outstanding French Sauterne wines are in the collection, including some rare Château D'Yquem wines such as the 1986 vintage ($900) and the 1990 vintage ($505 for 350 ml). Another great find is the 1962 Château Rieussec ($585). Among the ample selection of international dessert wines is the 1999 Elderton Golden Semillion ($105 for 350 ml) from southeast Australia, the 2001 Kracher Muskat Ottonel Trockenbeeren Auslese "Number 2" ($150 for 350 ml) from Austria, the 2000 Royal Tokaji Wine Col. "Birsalmàs" 5 Puttonyos ($135 for 500ml) from Hungary. Porto wines are stunning, including the 1977 Smith Woodhouse Porto ($365) and the 1970 Dow's Porto ($395). Guests who prefer a smaller serving of wine will be pleased that Oceanique has built a list of five white wines and five red wines that are exceptional values and can be purchased by the half glass, full glass or by the bottle. Featured white wines include a 2007 Compte Lafon Macon-Chardonnay "Clos de la Crochette" from France ($10 half glass; $18 full glass; $72 bottle) a 2010 Clos Pegase "Mitsuko's Vineyard" Sauvignon Blanc from Napa Valley ($9/$16/$64) and a 2009 Bibi Graetz "Cicala Del Giglio" from Italy ($9/$16/$64). Red wines on this special list include a 2006 Saint Martin Fixin "Hervelets" Premier Cru Pinot Noir from France ($14/$25/$100), a 2009 Cypher Winery "Anarchy", a Syrah-Zinfandel-Mouvedre blend from Paso Robles, California ($10/$18/$72) and a 2006 Heredad Soliterra Carignon-Grenache-Syrah blend from Spain ($9/$16/$64). Paul Hobbs ($125), both from Napa Valley. A delicious red wine blend is the 2006 Elyse "Nero Misto" from California, a blend of Zinfandel, Petite Syrah, Primitivo, Carignan and Syrah ($50). Zinfandel lovers will enjoy the 2006 Elyse Morisoli Vineyard from Napa Valley ($60). 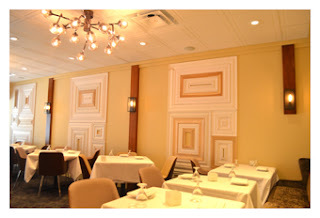 For 25 years, Oceanique Restaurant in Evanston, Illinois (505 Main St., Evanston IL; 847-864-3435) has been quietly and steadily amazing a large, loyal following of food and wine enthusiasts by offering one of the best fine dining experiences in the Chicago area. 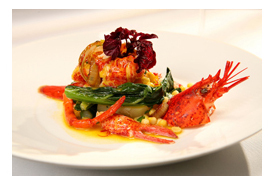 Those in Chicago's culinary circles know that owner, Chef Mark Grosz, is one of Chicago's finest. But this quiet and intimate restaurant, which has been content to be a highly successful best kept secret in the North Shore, has decided to celebrate its 25th anniversary by telling Chicagoans its story with a little more Chicago-style bravado. with their soulful, homey countenance. In their place is a light, airy, stylish and contemporary new look. There are fewer tables than before, making room for comfortable banquettes. Tables, chairs, table settings and lighting all form a new and cohesive atmosphere that brings out the beauty of Grosz's food while adding even more comfort and style to the Oceanique experience. Guests also may notice that Oceanique has actually reduced the number of seats in the restaurant to make it more comfortable and roomy. Oceanique's new look is more contemporary, lighter and airier," says Wine Director Philippe André. "We've created a brighter and more dramatic ambiance with new lighting that makes our tables-and Mark's amazing food-almost glow. But we haven't lost any of the intimacy and casual congeniality that has been our trademark since the beginning. In addition, we've have added some new dining options including a brand new small plates menu for the bar area." Over the years, this North Shore dining destination has quietly garnered a steady stream of acclaim as one of the area's best restaurants. Since 1993, Oceanique has been ranked as the number one seafood restaurant in the Chicago metropolitan area by the prestigious Zagat Guide. Oceanique's wine program is also world class, and attracts wine aficionados from throughout the Chicago area. Every year since 1994, Oceanique has earned Wine Spectator Magazine's "Best of" Award of Excellence. The magazine has declared the wine list as one of the world's 750 best. Longtime regular customers are pleased that Grosz's approach to the seasonal cuisine has remained basically the same, yet Grosz is confident that new customers will find the experience to be very contemporary. "Our food has always evolved, never staying the same," says Grosz. "The evolution of my culinary style stems from my travels around the world, where I've experienced wonderful dishes from a wide range of cuisines. 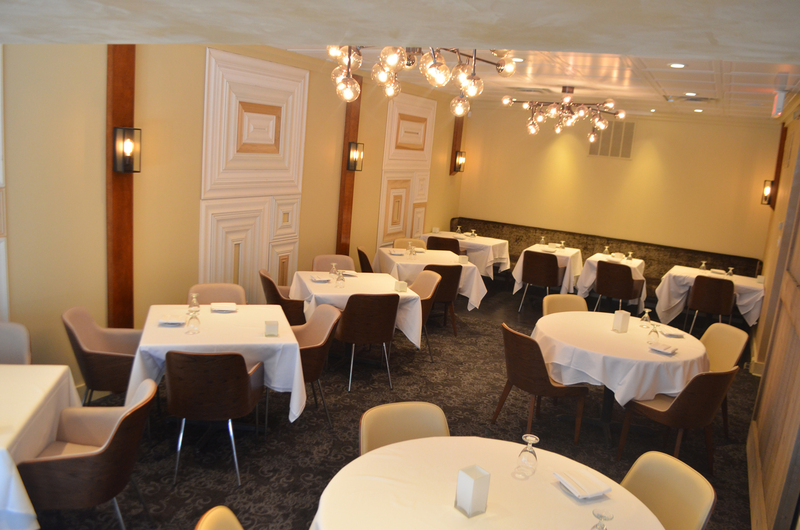 When Oceanique started, it was primarily a contemporary French restaurant. But over the years, our food has become much more international. We have always used the finest local ingredients and that certainly won't change. We also love to draw upon on the interplay of fresh herbs to create interesting flavors and textures-that also won't change. But in today's menu, you'll find more ingredients that are global in nature; we particular like to draw upon Asian ingredients." Oceanique has introduced a new small plates-focused menu for the bar area to satisfy the cravings of Oceanique's guests who wish to opt for a lighter, more casual meal, the restaurant has introduced a new Bar Menu, which features shareable small plates that can serve as accompaniments to the wine, beer and cocktails or can be combined to form a delicious, value-priced light meal. "The bar menu features shareable small plates to satisfy guests who aren't in the mood for a full, multi-course dinner," says Grosz's wife and partner Renée André. "We want to encourage people to stop by even on those days when they don't want the full multi-course treatment. They can have a wonderful glass of wine, artisan cocktail or craft beer to accompany an informal snack or meal in a care-free atmosphere. In the dining room we will still serve our à la carte menu and our tasting menus, with great wine pairings from our distinctive wine program, led by our son, Philippe." The bar menu includes such dishes as the Market Ceviche, with yuzu and pickled asparagus ($7); the signature Lobster Sandwich with Togarashi saffron aioli and served on brioche ($7); Maine Pemaquid Oysters with Pernod, spinach, Parmesan ($3 each) and Zucchini Blossom Tempura with manchego, tomatillo and shrimp ($7). Guests also can nibble on Oceanique's unique Mixed "Bag of Tricks" Nuts ($5) or savor the Italian Robiola Cheese with plum mostarda, watercress and pickled fennel ($5). Those who would like to stop in for an indulgent dessert paired with a glass of wine or coffee will enjoy the perfectly prepared Valhrona Chocolate Soufflé with lemon balm ice cream ($17). Specialty cocktails are also given great attention for the benefit of Oceanique's bar guests. Among the in-house creations are the Litchi Royale, made with N.V. Duval-Leroy Brut Rosé Champagne & Litchi Sorbet ($20); the Cucumber Martini, made with Hendrick's Scottish Gin, Cucumber, Fresh Sage & Combier ($16); the Açaí Gimlet, made with VeeV Açaí Spirit, Citadelle Gin, Lime & Basil ($17); and the Saint Germain, made with St-Germain Elderflower Liqueur, Champagne & Soda ($20). The dinner menu begins with a selection of Plats Froid (cold plates), including Wild Maine Day Boat Scallop Sashimi, with watercress, peach and yuzu ($20) and Chilled Maine Pemaquid Oysters with choice of jalapeno-red onion salsa and seaweed salad or rainbow trout caviar ($20) or lemon crème frâiche ($23). The Lightly Smoked Salmon is accompanied by radishes, cucumber, horseradish crème frâiche and casa nostra toast ($16). Other cold plate choices include Chicken Liver Mousse with "pickles", Madeira gelée, quail egg, manchego and poilâne toast & brioche toast ($14), and American Sturgeon Osetra Caviar with traditional garnishes ($65). caramelized pineapple and fennel ($24); Wild Maine Day Boat Scallops with cilantro kimchi lobster-soy broth, ($20); Roasted Maine Pemaquid Oysters with elote, purple cauliflower and saffron ($20); and Butternut Squash Ravioli with fennel, prosciutto, crispy sage and walnuts ($14). Salades et Potage (salads and soups) are refreshing and delicious. Choices include Wild Maine Lobster & Bufala Mozzarella, caviar and avocado ($22); Calamari Shrimp with daikon radish, candied ginger & lemon and sake ($14); Michigan Corn Soup with leeks, corn and Maine lobster ($15) and Local Beets and Warm Goat Cheese, with artichoke, pecans, organic lettuces and sherry vinaigrette ($14). Fruit de Mer (fish and seafood) entrées include Wild Alaskan Halibut with purple cauliflower, fennel, yellow beans and Porto ($40); Wild Delaware Skate with favas, purple potatoes, tropea onion and lemongrass ($38). Additional dishes include Bouillabaisse Oceanique with skate, halibut, salmon, shrimp, scallop, mussels and squid ($35) and Wild Maine Lobster (right) with local beets, red onion, basil potato and yuzu-saffron ($44). Viandes et Volailles (meats and poultry) selections are Nebraska Prime Filet Mignon (left), with escargot, purple potatoes, seasonal mushrooms, and cippolini ($47), and Hudson Valley Duck Confit, with foie gras, Belgian endive, spaetzle and black currants ($42). Guests who prefer a vegetarian entrée will enjoy the Eggplant, Heirloom Carrots & Tomatoes with seasonal mushrooms, tropea onion, and leek-basil broth ($23). The finale to every meal at Oceanique is the pastry tray presentation, featuring an array of luscious and tempting specialties, all priced at $12. Among the choices are Warm Cherry Claufouti Tarte with cherry ice cream; Day & Night Cake with chocolate mousse, whipped crème chantilly, chocolate cake and chocolate ice cream; Warm Raspberry-Blueberry Tarte with blueberry ice cream; and Valhrona Chocolate-Caramel Pot de Crème with creamy chocolate custard and candied hazelnuts. Oceanique's seven-course tasting menu has been a magnet for food and wine aficionados on the North Shore and beyond, and the Summer Degustation Menu ($105 per person; $170 with wine pairings) continues the tradition of presenting a magnificent generous sampling of Chef Grosz's favorite dishes. The degustation begins with Wild Maine Lobster with caviar, bufala mozzarella and avocado. The second course continues the meal with Wild Maine Diver Sea Scallops in a kimchi lobster-soy broth. The third course is a tasty delight, Butternut Squash Ravioli with walnuts, prosciutto and crispy sage. The fourth course features Wild Icelandic Cod with seasonal mushrooms, bacon and turnip. After a seasonal sorbet intermezzo, the sixth course consists of Hudson Valley Duck with foie gras spaetzle, Belgian endive and black currents. The final course is a presentation of Pastries from Pastry Chef Abel Garcia. Oceanique's wine program is more front and center than ever before. Wine Director André has updated his pairings to reflect the sway of the seasons. Oceanique offers three levels of wine pairings ($65, $99 or $199 per person). There is an excellent selection of wines by the glass and the wine list is so extensive that it offers something for every taste, food offering and budget. Guests find the wine service at Oceanique to be very knowledgeable, yet refreshingly gracious and down to earth. "Over the years, our wine program has become more than an addition to the Oceanique experience but rather, a beautiful companion to our fine cuisine," says Wine Director André. "Our wine cellar contains a wide spectrum of varietal offerings with an outstanding collection of rare Champagne, Burgundy and Bordeaux. Oceanique's cellar not only holds some 700 labels (between 8,000 and 9,000 bottles) at a precise 57° and 64% humidity, it strives to offer something special for every dish, every person, and every occasion." 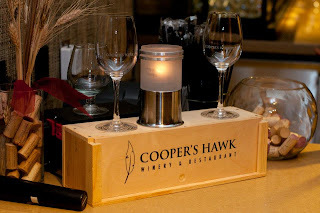 Please join the Kidsave Chicago Summer Miracles Community of supporters, volunteers, potential host families, visiting families and advocates at the beautiful Cooper’s Hawk Winery & Restaurant (798 W Algonquin Rd Arlington Heights, IL 60005). Enjoy 3 hours of four unlimited Cooper’s Hawk wine selections, appetizers, silent auction and more!! With your support, Kidsave will be able to facilitate its visit model by providing children with volunteer advocates who help them find permanent families and connections to caring adult mentors. A minimum of 7 Colombian children living in government care, ages 8-13, will visit Chicago in the summer of 2014. Meet and hear testimonials from this summer's host families, learn about the children we hosted this summer, hear updates on what's in store, meet Lauren Gordon from Kidsave headquarters in Culver City, CA and more! For questions on how to get involved, please email marub@kidsave.org or taylorl@kidsave.org . Sign Up: Sign Up or Donate Today! Ultra Premium has very rigid criteria for extra virgin olive oil. What does that mean to customers? Ultra Premium is the recognized standard for the world’s finest and freshest extra virgin olive oils. Its grading exceeds all existing European, Italian, Spanish, Greek and North American grade standards. In order to qualify for the Ultra Premium grade, the extra virgin olive oil must meet or exceed a comprehensive set of production, storage, transportation, testing, chemistry, and organoleptic requirements. Come to Oh Olive! and buy a bottle at the Chicago French Market today! Chicago musician Matt Cantlon has been playing guitar and singing for more than 20 years. 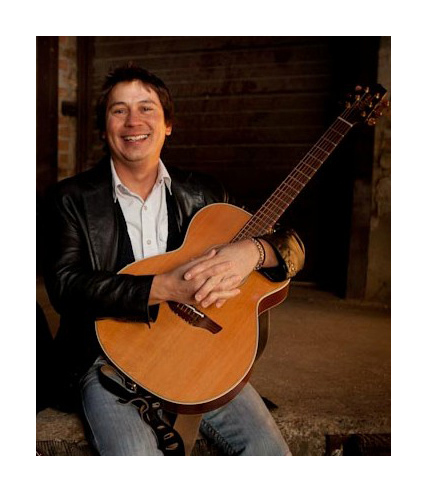 In addition to doing solo acoustic gigs, he also plays in the popular duo The Acoustic Generation. Matt averages about 200 live gigs a year and when he’s not performing, he’s busy writing songs. Matt’s song list is quite extensive and includes classic from many different genres. Rock, Country and Pop are just some of the types of music that Matt play on a regular basis. 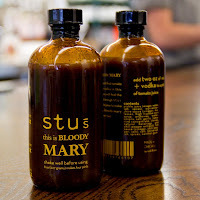 Meet the maker of Stu's This is Bloody Mary Mix and Stu's Sour Pickles, Stu Waters, 11 a.m. to 2 p.m., Thursday, September 19 and sample Stu's delicious Bloody Marys and crisp Sour Pickles during this unique complimentary tasting event. 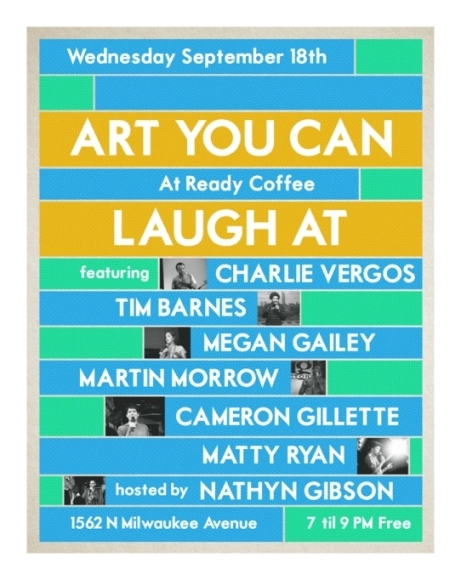 Back by overwhelming demand, Art You Can Laugh At returns to Ready Coffee’s ORNOT Gallery (1562 N. Milwaukee Avenue, Chicago, 773-360-7041) 7 p.m. Wednesday, September 18. Hosted by resident comedian Nathyn Gibson the complimentary show will feature performances by comics Matty Ryan, Charlie Vergos, Tim Barnes, Cameron Gillette, Megan Gailey and Martin Morrow. No reservations are necessary. Seating is limited to first come with plenty of standing room. Matty Ryan is a Chicago classic. Born, bred, and beer-battered in an Irish neighborhood on the city’s South Side, Matty has been touring and performing throughout Chicago and beyond for the past several years. His rapid-fire delivery and deft takes on his burgeoning (and unwanted) adulthood, things he’s learned from the elderly, and the fine art of the outdoor nap have made him a favorite at showcases and clubs throughout the country. An alumnus of the Second City, Matty has appeared at Zanies, The Laugh Factory, The Improv, and the Hollywood Comedy Store. He currently co-produces The Blackout Diaries every Saturday at The Lincoln Lodge, and Parlour Car every Thursday at Bar Deville; both in Chicago. Also, please tell your parents he says hello. "Charlie Vergos is an easily distracted 24-year old little brother who grew up working in his family's barbecue restaurant in Memphis, TN. He began doing comedy there in 2009, until he saw something shiny and followed it to the comedy scenes of New Orleans, Cape Town, back to Memphis, and now Chicago. Charlie's energy has been described by important people as 'part-contestant on Kids' Jeopardy, part 74-year old bluesman.' His act may or may not include drawings, piano, juggling, off-brand Mad Libs, or getting lost on the way to the stage. Charlie has performed comedy in four different countries, worked in the Onion's graphics department, served as the editorial cartoonist for two newspapers in New Orleans, opened for Sean Patton, and won a pie-eating contest in Branson, Missouri when he was in 5th grade (No hands). Oh, and he's really funny." Cameron Gillette grew up in Birmingham, Alabama, raised by excessively conservative parents and for the first 20 years of his life was very, very bored. Finally, at 20, he tried his first stand up open mic, and his consciousness was awakened. He was eventually performing regularly at the Stardome Comedy club, but quickly became frustrated with the lack of opportunities for stage time in Alabama. Along with a group of like-minded comedians, he started putting on shows at bars and coffee shops around the city. After 2 years, these shows were gaining a big following. Although Birmingham was beginning to have a comedy scene he could be proud of, he decided he wanted to pursue comedy full-time in a big city. In January of 2010 he moved to Chicago and was quickly recognized as one of the funniest up-and-comers up-and-coming. He has performed all over the city since then at places like The Lincoln Lodge, The Laugh Factory, and Comedians You Should Know. In the past year Gailey was a finalist in NYC’s Laughing Devil Festival, a featured performer at Just For Laughs, the Traverse City Winter Comedy Festival and selected as one of Comedy Central’s Chicago Comics to Watch. Megan was recently featured in Chicago Magazine for her comedic risk taking and amazing dresses. And she has finally performed alongside enough famous people that her older brothers no longer hate her. Gailey is a must-have at top National Clubs like the The Laugh Factory (Chicago), Hilarities (Cleveland) and The Comedy Club (Rochester, NY). Opening for Brad Garrett, Kevin Nealon, Amy Schumer, Paul Reiser, Doug Benson, April Macie and TJ Miller. Megan also loves all the stages in Chicago, performing for fellow downtown yuppies at Comedians You Should Know and Second City, hip Northside crowds at The Lincoln Lodge, and even for crowds that should inherently hate her but wind up loving her at Mikey O’s Comedy Cantina. A founding member of Chicago’s stand-up and sketch group "Your Funniest Friends" and co-host of the Chicago comedy podcast "Naked Sports Live" Megan works and applies makeup at a fanatical pace. She continues to search for a rich husband, just in case. New York and has worked with some of the top names in comedy including Eric Andre, Hannibal Buress, Kyle Cease, Judah Friedlander, Jamie Kennedy, Natasha Leggero, Tim Meadows, Tig Notaro, Sean Patton, Paul Rodriguez, Craig Shoemaker, Amy Schumer, and Baron Vaughn. Currently residing in Chicago, IL, Martin has performed in several shows with Second City as a part of their Outreach & Diversity ensemble in addition to being a Second City PUMA scholarship recipient, and has put on several one man shows at The Playground Theater and MPaact Theater, and was a season 13 cast member of the longest running independent comedy showcase the Lincoln Lodge. His work has been featured on the Huffington Post, was a finalist in the seventh season of the Impress These Apes comedy competition, and performed in the 2013 Just for Laughs Festival. Despite his accolades in comedy, Morrow is perhaps best known from his work in the 1953 Walt Disney classic Peter Pan as Peter Pan's shadow. 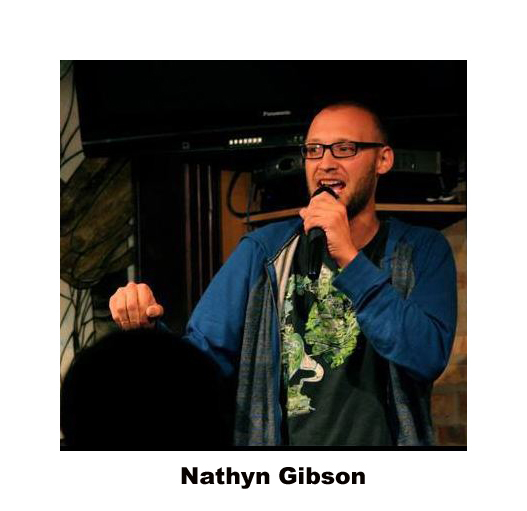 Nathyn Gibson is the host of the ORNOT Gallery’s Comedy Showcase: Art You Can Laugh At. Nathyn moved to Chicago last summer to pursue comedy. He also co-produces a monthly showcase in Logan Square called Black Star Comedy and is a regular performer in the A Night of Comedy series in Crown Point, Indiana. "Chicago has an amazing comedy scene, and I want to be an outlet to show what this town has to offer," said Nathyn. The leaves are changing and fall is coming. Before we get to the Thanksgiving and holiday feasts, restaurants are gearing up for warm beverages, hearty dishes and the best comfort foods. Here's a roundup of what our clients have in store for you when it gets chilly outside. “The sweet Nutella latte with hazelnut undertones will sooth and satisfy your taste buds on a cool day while the cinnamon provides an extra layer of spice to your palette. 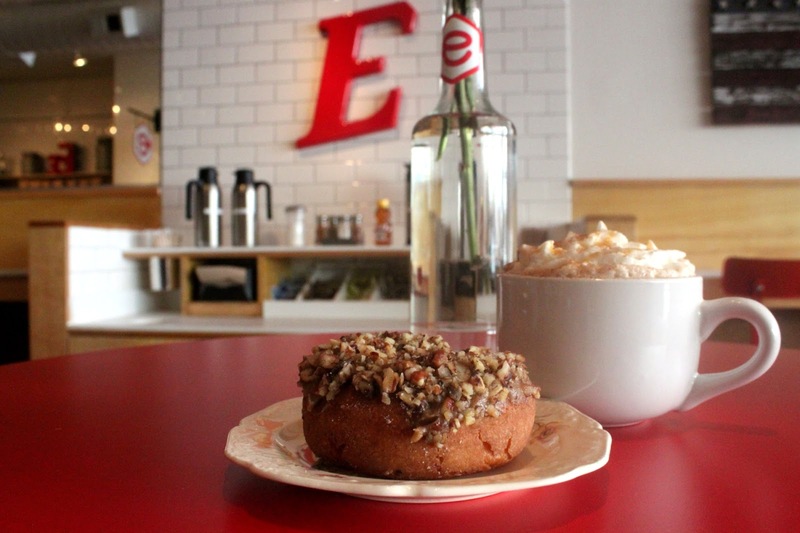 The pecan and maple donut is a delicious complement to a chocolatey coffee that will keep you warm from your fingers to your toes,” says Lucas Black, Barista. “Cold and flu fighter” raw juice $8 (Emergen-c, celery, green apple, orange, lemon, ginger) with a Shot of wheatgrass $2.50. “Boost your energy and immune system with a combination of our Cold and Flue Fighter raw juice- filled with fruits and veggies to to keep you healthy, as well as a shot of wheatgrass on the side adding extra nutrients and vitamins to prepare your body for the upcoming winter! Cheers!,” says Lucas Black, Barista. Crazy for Peanuts? September 13 is for you. We thought we’d take a moment to pay homage to our favorite nut. Whether savory or sweet, Delightful Pastries makes celebrating National Peanut Day, September 13, a slam dunk. Start off by lunching on He Lives!, an amazing Peanut Butter and Grape Jelly sandwich with Lean Crispy Bacon, Banana, House Secret Sauce on an all-butter croissant, $8. Still craving peanuts? Try the delicious Triple Decker Peanut Butter Brownie topped with peanut butter and delicious chocolate ($3.50 each) or the Peanut Butter Chocolate Cupcake ($2.75). Entertaining? Pick up a Peanut Butter Pie with graham cracker crust topped with peanut butter custard and decorated with chocolate fudge and salted peanuts. The pie is available in a single mini-serving size ($5.25) or as a full pie ($25) which serves 8-10. Lucky for us, you don’t have to wait until Fat Tuesday to celebrate Delightful Pastries’ Paczki. September 14 is National Cream-Filled Donut Day and the perfect time to tie one on with Delightful Pastries’ famous Drunken “Paczki” Donut. You heard us right. This delightful pastry (a traditional Polish doughnut) is filled with booze and cream. Dobra Bielinski, pastry chef and co-owner of Delightful Pastries, keeps her three Chicago bakeries stocked with paczki all year long. On any given day, you can choose strawberry and whipped cream, raspberry jelly or custard topped with chocolate fudge paczki. 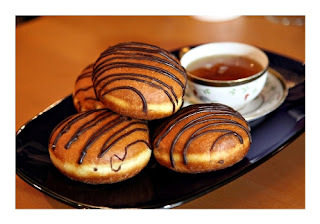 Or, you can sample "drunken" paczki in scrumptious varieties like vodka and vanilla bean custard, Patron XO Cocoa with chocolate custard, and orange liqueur and passion fruit jelly. As if anyone needed a special day to celebrate, why not Saturday, September 14 on National Cream-Filled Donut Day? Nothing says back to school better than a lunch box filled with wholesome goodies and tasty snacks. Delightful Pastries at the Chicago French Market says no lunch box is complete without one of its fabulous brownies ($3.50 each). Whether it be the Paradise (a brownie filled with layers of pecan and caramel, topped with bittersweet chocolate ganache), Fudge (amazing brownie combining an all butter crust and Belgian Callebaut chocolate), or Triple Decker Peanut Butter(brownie topped with peanut butter and delicious chocolate), your child will be the envy of the class. If you’re not into chocolate or have nut allergies, try Delightful’s Lemon Bar (made of all-butter-crust with freshly squeezed lemon juice) or their Cranberry Orange Squares (sweet cookie dough made with fresh cranberry and orange filling, topped with cinnamon streusel), always a crowd pleaser. Looking for healthy choices, perfect for you and your kid’s lunch? Delightful Pastries also is the creator of wonderfully fresh homemade sandwiches and soups all made from scratch using family recipes. 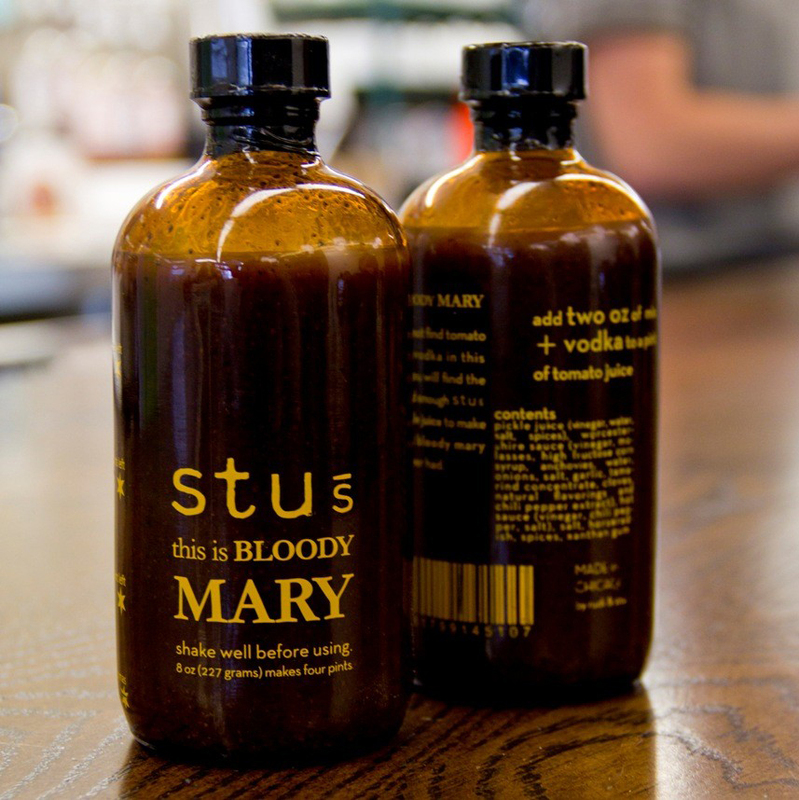 "Even the sauces in the sandwiches, such as homemade horseradish sauce, are made in-house daily. We believe that every customer deserves the best quality food just like how we make them at home,” says co-owner Robert Hawryszczuk. What this means is that all Delightful Pastries sandwich ingredients are freshly prepared without preservatives or other fillers. “If you can imagine a sandwich where the homemade bread is just-baked, the meat is local and all natural, the bacon is lean, thick-cut and locally cured, and where the ham and pork cutlets are from a local Polish butcher, then you have a good idea as to why our sandwiches have so many fans,” says Delightful Pastries co-owner Nico Hua. Chicago French Market sandwich favorites include The Polish ($8.25), with Polish ham, Swiss cheese, homemade horseradish sauce, mayonnaise, Dijon mustard, tomato and field greens, served on a fresh butter croissant; The Thanksgiving ($8.25), hand carved turkey breast, Swiss cheese, homemade horseradish, mayonnaise, Dijon mustard, cranberry sauce, tomato and field greens on a fresh butter croissant; The Fusion ($8.25), shrimp salad, mayonnaise, spice, pickles and field greens on a fresh butter croissant, and The Three Piggly Wigglys ($10), made with Polish ham, lean crispy bacon, pan fried schnitzel and pickles, served on an “everything” bun. Peanut butter lovers can’t resist He Lives! ($8.25 with peanut butter, grape jelly, lean crispy bacon, banana, house secret sauce, all served on a fresh butter croissant.